Jonathan Fishman, Edward Fisher, Musheer Hussain,	The Journal of Laryngology & Otology, Volume 132 Issue 11, p 951. K Conroy, V Malik,	The Journal of Laryngology & Otology, Volume 132 Issue 11, pp 952-955. V Sekhar, E Wong, H A Elhassan, N Singh,	The Journal of Laryngology & Otology, Volume 132 Issue 11, pp 956-960. D J Tweedie, J Cooke, K A Stephenson, S L Gupta, C M Pepper, M D Elloy, L A Cochrane, M E Wyatt,	The Journal of Laryngology & Otology, Volume 132 Issue 11, pp 961-968. A S Harris, E Prades, C D Passant, D R Ingrams,	The Journal of Laryngology & Otology, Volume 132 Issue 11, pp 969-973. F Arslan, M Binar, U Aydin,	The Journal of Laryngology & Otology, Volume 132 Issue 11, pp 974-977. 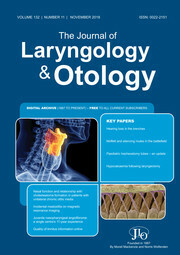 A E Pamuk, S Özer, A E Süslü, A Akgöz, M Önerci,	The Journal of Laryngology & Otology, Volume 132 Issue 11, pp 978-983. R M McKearney, R C MacKinnon, M Smith, R Baker,	The Journal of Laryngology & Otology, Volume 132 Issue 11, pp 984-989. S P S Yadav, J S Malik, P Malik, P K Sehgal, J S Gulia, R K Ranga,	The Journal of Laryngology & Otology, Volume 132 Issue 11, pp 990-994. F Gündoğan, A Bayram, M Kalkan, İ Özcan,	The Journal of Laryngology & Otology, Volume 132 Issue 11, pp 995-999. C Shaul, A S Dragovic, A K Stringer, S J O'Leary, R J Briggs,	The Journal of Laryngology & Otology, Volume 132 Issue 11, pp 1000-1006. H Demirhan, Ö Yiğit, B Hamit, M Çakır,	The Journal of Laryngology & Otology, Volume 132 Issue 11, pp 1007-1009. Y Abbas, H S Yuen, A Trinidade, G Watters,	The Journal of Laryngology & Otology, Volume 132 Issue 11, pp 1010-1012. E Choffor-Nchinda, F Djomou, R-C Meva'a Biouele, D Mindja, A Bola, I Kewe, J-E Vokwely, R Njock,	The Journal of Laryngology & Otology, Volume 132 Issue 11, pp 1013-1017. G Berkiten, İ Aydoğdu, T L Kumral, Z Saltürk, Y Uyar, A Arslanoğlu, B Tutar, A E Göker,	The Journal of Laryngology & Otology, Volume 132 Issue 11, pp 1018-1021. D J Lin, C J Lewis, M Alrawi,	The Journal of Laryngology & Otology, Volume 132 Issue 11, pp 1022-1025. J R Abbas, J R Abbas, K E L Hamlett, J de Carpentier,	The Journal of Laryngology & Otology, Volume 132 Issue 11, pp 1026-1028. D Jančatová, K Zeleník, P Komínek, M Formánek,	The Journal of Laryngology & Otology, Volume 132 Issue 11, pp 1029-1031. W Ahmed, S Connor, R Obholzer, I Pai,	The Journal of Laryngology & Otology, Volume 132 Issue 11, pp 1032-1035. J E Fenton, C Fitzgerald, P J Dillon, D O'Shea,	The Journal of Laryngology & Otology, Volume 132 Issue 11, pp 1036-1038. J Suzuki, Y Takanashi, A Koyama, Y Katori,	The Journal of Laryngology & Otology, Volume 132 Issue 11, pp 1039-1041.